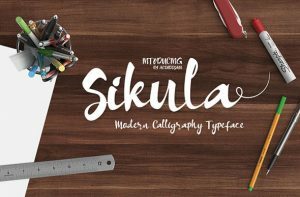 Sikula Font is a beautiful modern calligraphy font every single letters have been carefully crafted to make your text looks beautiful … This hand-lettered script font will look gorgeous on all your designs, websites, invitations, greeting cards, magazines, business cards, packaging and more! Sikula Font contains standard characters, lowercase, uppercase, numbers, Stylistic Alternates and international characters. A font family published by aceh on Thursday, June 2nd, 2016 that has 2,447 views so far.